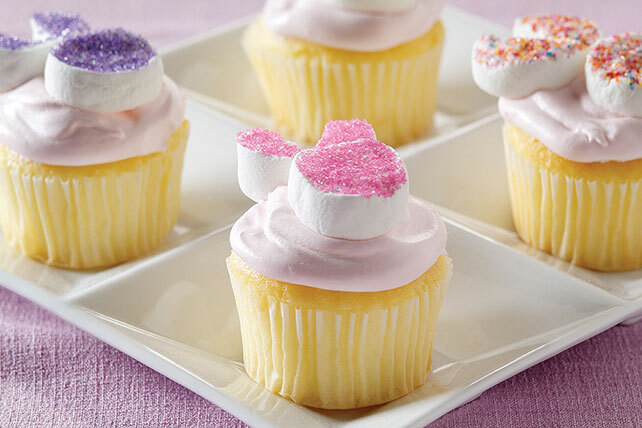 Make these Fluffy Marshmallow Bunny Cupcakes for a sweet Easter treat. These bunny cupcakes are topped with marshmallow bunny faces dipped in colored sugar. Prepare and bake cake batter as directed on package for 24 cupcakes; cool completely. Cut each marshmallow crosswise in half with clean kitchen shears. Press cut-sides of 24 marshmallow halves into colored sugar; flatten each slightly for the bunny's face. Cut through center of each of the remaining marshmallow halves to within 1/4 inch of opposite side; separate pieces slightly to resemble the bunny's ears. Press cut-sides of each ear into colored sugar; flatten slightly. Arrange faces and ears on tops of cupcakes. Decorate faces with gel. Keep refrigerated. Decorate bunny faces with assorted small candies and colored sprinkles.